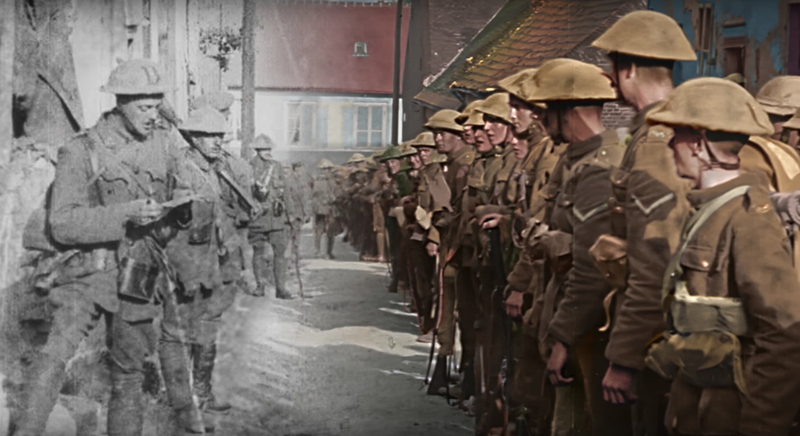 I started to complain about Peter Jackson’s commission from the Imperial War Museum to colourise their archival war footage when I first heard about it earlier this year, and now I’ve actually seen the result, ‘They Shall Not Grow Old’, I’ve decided to keep on complaining. This, despite two moments in his feature length film about the experience of English men at the Western Front which do truly take the breath away. Jackson bookends his VFX historical concoction with two extended sequences of ‘authentic’ black and white footage complete with scratches, hair in the gate, and even the clattering sound of an old film projector. About half an hour into the film, at the moment in the film’s narrative when the men arrive at the Front we, the audience, see the ‘archival’ film magically transition to full colour, correct speed, and full cineplex-quality Dolby sound. To Jackson’s credit it is a truly astonishing, and moving, moment. We are exiting History and entering Experience. After about another hour, when the men have won the War, we transition again, back home to jerky black and white, from Experience back to mere History. These moments have roots deep in the history of media. In the 1890s many people saw their first kinematograph film through a hand cranked attachment placed on the front of a magic lantern. Canny operators would hold the first frame of their ninety second filmstrip in the gate so the audience thought they were looking at a standard glass magic lantern slide, then they would begin to crank the image into lifelike animation. This moment of phenomenological wonder wrought by drawing attention to the very apparatus of representation itself has been rehearsed frequently since. Perhaps most pertinent to Jackson’s film is the transition from black and white to colour, at about the same narrative points, in ‘The Wizard of Oz’, where the film transitions from the familiar Hollywood black and white to the new Technicolor. We’re not in Kansas anymore in ‘The Wizard of Oz’, just as we’re not in Documentary anymore in ‘They Shall Not Grow Old’. These two moments are the film’s triumph, and all the talk has rightly been about the creation of lived experience from supposedly inert archival material — the lip reading, the stretched frame rate, the image sharpening, the 3D, and so on. So it is interesting that many of these ‘effects’, so lauded for their technical novelty today, were in fact in play before the War itself had even ended. 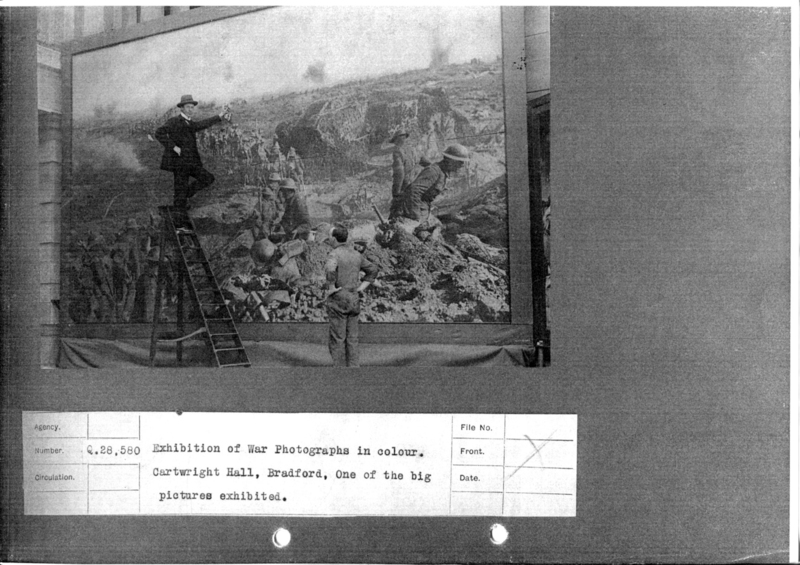 A giant composite mural coloured with aerograph and oil stick on dispaly c1918, from Imperial War Museum archive. Jackson composites separate archival images together into the one frame, he passes off footage shot of training exercises as actual battles, and he closely edits together images shot far apart to make it seem as though we are seeing one action, one dramatic moment. I’m not going to be churlish, that’s fine. In fact it was being done in 1918, even before the Armistice, by the photographers Ivor Castle and Frank Hurley who worked for the Canadian, British and Australian propaganda units. They did it for a series of giant collages and hand coloured murals made for exhibitions in the UK during 1918. The only VFX Jackson has in his arsenal which Castle and Hurley didn’t have is the loop. And he uses the loop to dilate time like the master he is. In his film men look over their shoulder with impending dread, or stroke the necks of dogs with PTSD distraction, for a sublime, looped, eternity. The fact that the War was actually being commemorated before it had even ended is only one of the about five billion other inconvenient truths about the War which Jackson’s film has to ignore in order to sustain itself. The film might be about a male English soldier’s experience, but surely we can handle more complexity than the Joseph Cambellesque narrative arc of: we didn’t know what we were getting into, it was an industrial hell, we had a battle where we found reserves of Edwardian heroism we didn’t know we had, we won that battle, we returned home and nobody understood us. That this is a story from the cineplex, not reality, is betrayed by the fact that in the frenzied thick of its digital editing of the battle sequence the film doesn’t distinguish between photographic imagery and popular graphic imagery derived from Boy’s Own propaganda. True, there is virtually no imagery directly from WW1 battles, so Jackson had a problem. 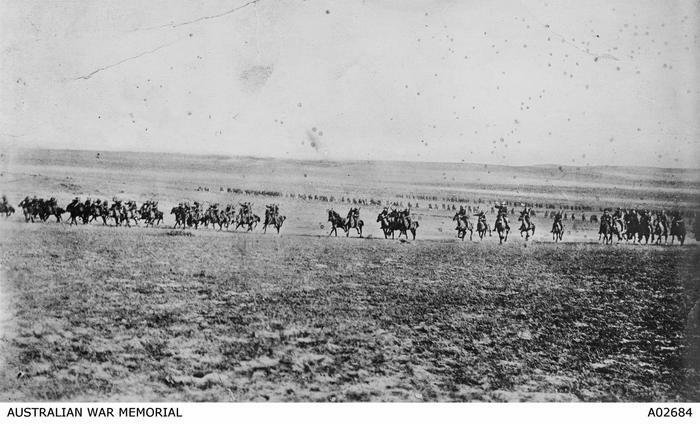 A film which used the same footage as Jackson’s, Charles Urban’s ‘The Battle of the Somme’, shown in London in 1916 (two years before the Armistice) to bring the reality of trench warfare home to complacent UK audiences, had the same problem, and also had to use footage of training exercises to stand in for actual battles. And perhaps Jackson was also trying to make the point that for these brief moments the young men temporarily entered the mythology of war under which they had enlisted, but even if he is trying to make this jingoistic point, is it is lost in the ontological muddling. The only thing masking the narrative banality which is at the heart of Jackson’s film, and which it cannot rise above, is the voices of the returned soldiers which drive the soundtrack. They also have been been conjured from the archive of oral history, but come through, along with all their distinct and distant accents, as clear as a bell. Without those voices, Jackson’s VFX would bleach to nothing. Their voices, and their dental work. 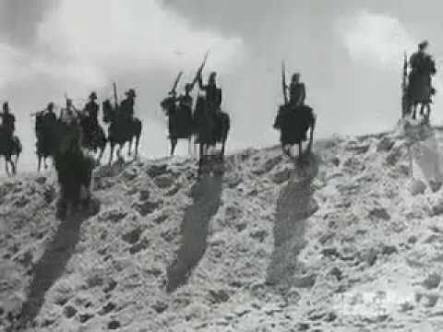 In 2018 nobody can exit the film without wondering at the rank tombstone teeth of the soldiers. Thank God Jackson didn’t give them digital orthodontics. Those crumbling teeth stoutly defend the truths of history in the face of Jackson attempts to conjure the cinematic effects of experience. Peter Jackson’s colourisation of Imperial War Museum footage. Three years ago, so the media release goes, the Imperial War Museum approached Peter Jackson, famous director of The Lord of the Rings, ‘to see what could be done’ with their archival film footage of the Great War. Jackson’s answer was to slow the footage to the frame rate at which it had been originally shot, remove scratches, grade it and sharpen it. All this is what any good digital restoration does. But Jackson then went on to add colour to it. This is not restoration, because something is added which was not there in the first place. And it is not even ‘enhancement’, it is destruction. Any creative re-use of archival footage is generally to be supported, and purist approaches to some notion of untouched archival sanctity get us nowhere. But the wholesale colourisation of archival footage is becoming more and more common recently. Jackson is not the only film maker to claim that colourisation is essential to bring ‘neglected’ or ‘lost’ or “forgotten’ footage to new audiences. And his is not the only company with a digital colourisation process to sell. 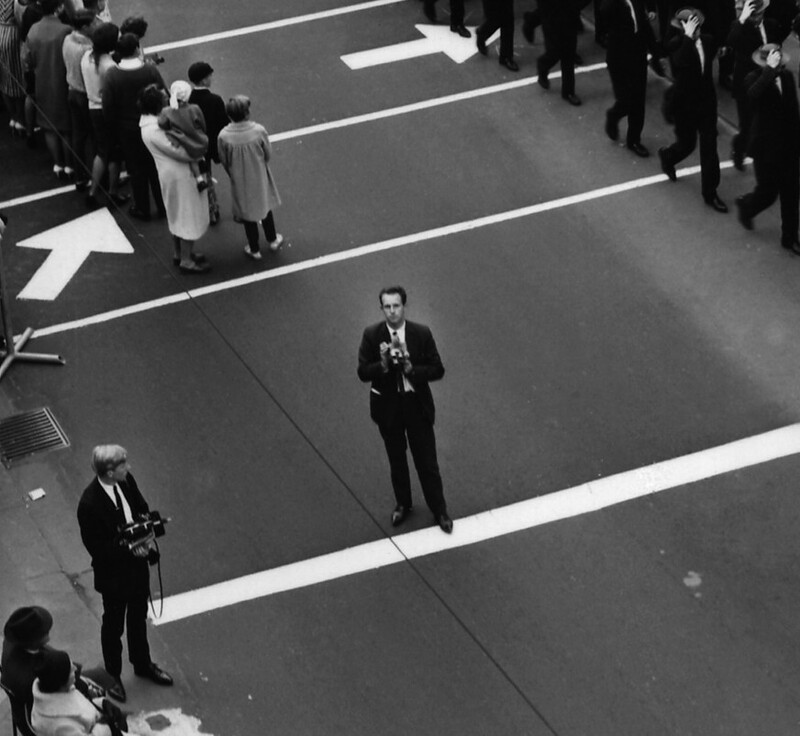 For instance this year Screen Australia’s documentary funding program supported Stranger Than Fiction Films to use a French company to colourise ‘pivotal moments in our nation’s history’ for SBS. So it may be worthwhile to take a step back and consider the long term impact on our historical consciousness of wholesale colourisation as an archival default. What is its effect on affect? The director of the Imperial War Museum, Diane Lees, states the argument for colourisation: ‘what we want to do is to take film that is very often dismissed by audiences because it is black and white’. There seems to be two strands to this argument: colour will somehow appeal to young eyes put off by boring old drab black and white with its association with – yawn – school history lessons; and colour is closer to the ‘reality’ for which the original cameramen strove, but were prevented from achieving because the technology they needed was yet to be developed. Both arguments are wrong. Colourisation is not a gift to young people, it robs them of visual and historical literacy. It diminishes their ability to appreciate the full and beautiful range of tonal and chromatic spectra associated with each decade’s intrinsic technology. The technologically immersed young clearly have no problem in choosing from amongst the 24 default Instagram filters, including several in monochrome, with all of their historical associations, so why is their discrimination not trusted by Jackson and Lees? And is a digitally colourised frame, where colours from a pre-determined palette are arbitrarily overlaid in a paint-by-numbers fashion, closer to reality than the original 256 tones of grey? We may know the original colour of a uniform, or an epaulette; but somebody’s skin, or their wallpaper? We can all, now, have a little snicker at Roland Barthes who, writing as late as 1980, still couldn’t help himself thinking that colour was: ‘a coating applied later on to the original truth of the black-and-white photograph.’ For somebody like Barthes, who grew up when press photographs and films were overwhelmingly black and white and expensive colour was reserved for special portraits and fiction, colour was an artifice, a cosmetic like the kind used to paint corpses. Now the situation is reversed, for those who came of visual age amongst colour, black and white is the connotational accent, signifying a certain classical aestheticism, laid on top of the RGB substrata. This indicates the fluidity of the exchange between black and white and colour. It is not just from an incomplete to a complete image potentiality, it’s an historical dialectic. But anybody who has worked in the area of colour reproduction, Peter Jackson most particularly, knows that there is no prelapsarian urcolour waiting to be discovered. From Paget plates, to Dufay colour, to Kodachrome, to Technicolor, to the bling of today’s Canon or Sony firmware, all supposedly ‘natural’ colour is technologically sampled and replicated, and therefore of its time. Jackson is not returning what was lost, not clarifying what was muddied. He is just adding a supernumerary layer and obscuring the past with a chromatic corrosion from today. This is the first sin of historicism. Some colour profile has to be generated for the palette from which different colour values are assigned to various areas in the tonal image. The colourisation efforts I have seen so far project a vaguely retro palette back into the past — unlike today’s colour technology but also unlike any actual primitive colour technology of the past either — perhaps closest to Instagram’s ’Slumber’ filter. Jackson says: ‘the people come to life in this film’. And that is the problem. They are not alive, they are dead. Allow us to meet them in their own technological time, not in a fantasy of ‘presence’ which is really just a current technological effect. Some of the news reports suggest that Jackson is even adding digital 3D (although perhaps, let’s be thankful for small mercies, they mean 2.5D) to the archival footage. The hyper realism of stereoscopic photographs was also an important part of the contemporaneous experience of the Great War. (For instance in Australia the Rose Stereographic Company produced thousands of stereo views of the War.) But if it is true that Jackson plans to invent a new 3D effect within the archival footage, then the revenant automata manufactured out of the indexical template of the scanned film frames will even further divorce contemporary audiences from a profound acknowledgement of the significance of those who once lived within a specific past. They deserve to be more than just retro effects within the present. Charge! And Charge again! And again! And again! 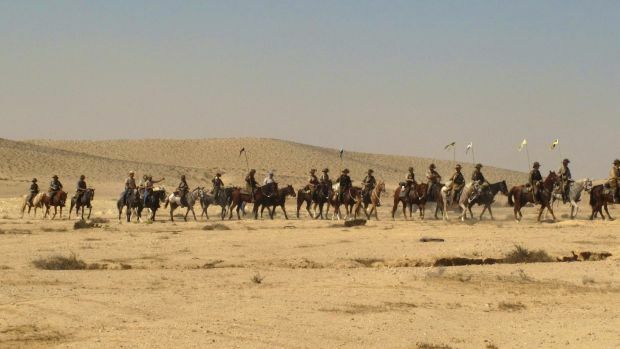 No other Australian battle has been reenacted as often as the Battle of Beersheba. 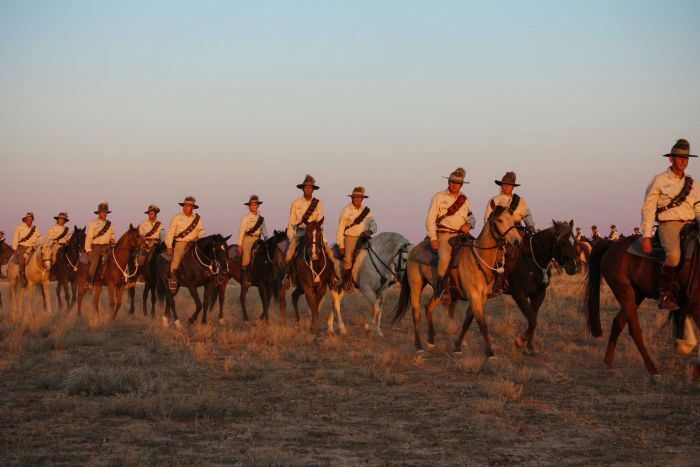 Although the America Civil War is the most reenacted war in history, something about the 1917 charge of the Light Horse on the Turkish foothold in Palestine has the same elements of attraction for Australian reenactors. It’s probably the comforting links back to preindustrial warfare and to an ‘Outback’ national mythos that makes this ANZAC Melbourne Cup so attractive for those who want to feel what it felt like a hundred years ago. But, reenactment was at the battle’s very origin. 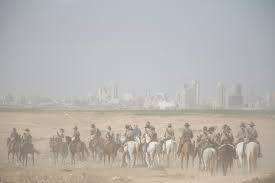 For decades a photograph of distant horsemen against a parched horizon was taken to be an authentic document grabbed by a frightened Turk as the 800 hoses thundered down on him. It wasn’t, it was taken by Frank Hurley more than three months after the battle in early 1918. Hurley characteristically exaggerated the number of men put at his disposal for the reenactment to 1000, but the men themselves resented being conscripted for such a ‘rehearsal’ so soon after the trauma of the actual event, and refused to push their horses to a full gallop. 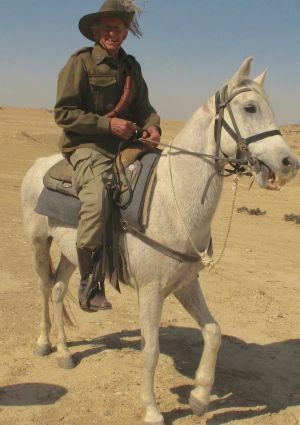 In September this year a hundred horses reenacted the charge at Winton in Queensland, and on the hundredth anniversary of the Battle a couple of days ago Australian enthusiasts reenacted the charge in front of the prime minister and opposition leader back at Beersheba, now in Israel, on horses borrowed from an Israeli pony club. The first assault on the dignitaries was at a slow trot, but later thirty horses suddenly returned for a charge at full gallop.